Article reviews the technology of solar modules based on silicon photovoltaic cells. 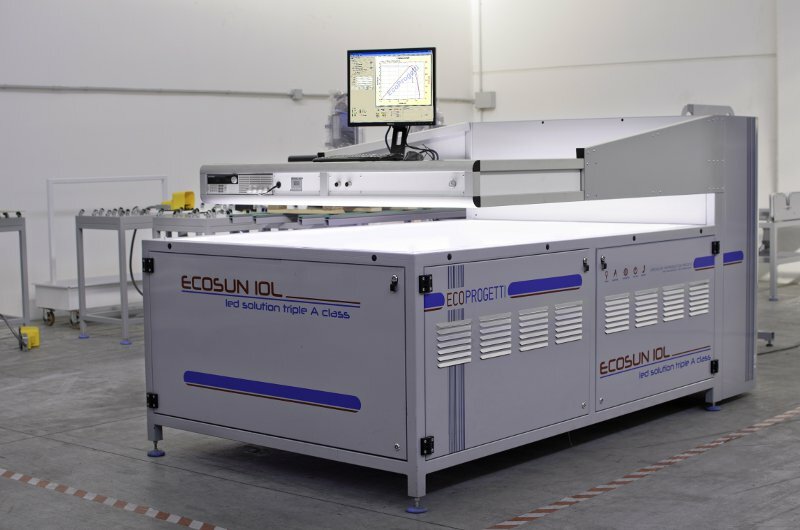 Briefly considered a standard process that is used with small changes on the majority of today’s industrial enterprises producing silicon solar modules. This article continues a series of stories about the production of components for the solar industry, which began in the article «Fundamentals of the technology of production of silicon solar cells». Here we look at a typical manufacturing process of solar modules based on crystalline silicon photovoltaic cells. Solar modules (or as they are often called — solar panels) are an essential component for the construction of solar power plants. The technical characteristics of solar modules depends on how much electricity it will be able to get from a unit area, how long it will last and which costs will be spent. Today, the price of solar panels all over the world are gradually lower, which greatly promotes to the improvement of technological processes and the transition from manual operation to automatic one. Achieving equality of prices for electricity generated from renewable sources, and electricity generated from traditional sources — the main goal of the whole industry. mounting frame and junction box testing. 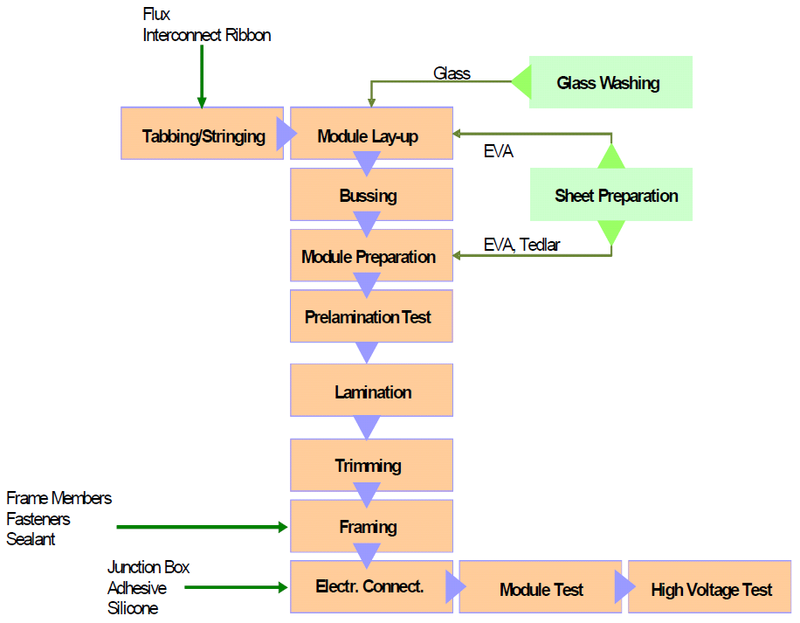 Overall block diagram of an exemplary production process of solar modules is given below. aluminum profiles and other materials. Thereafter, in a special way to enter sorted solar cells assembly operation using tabbers/stringers, i. e. equipment on which occurs first soldering to top and front contact solar cells pre- tinned copper straps, and then — a serial connection of these solar cells into strings (strings) required length. 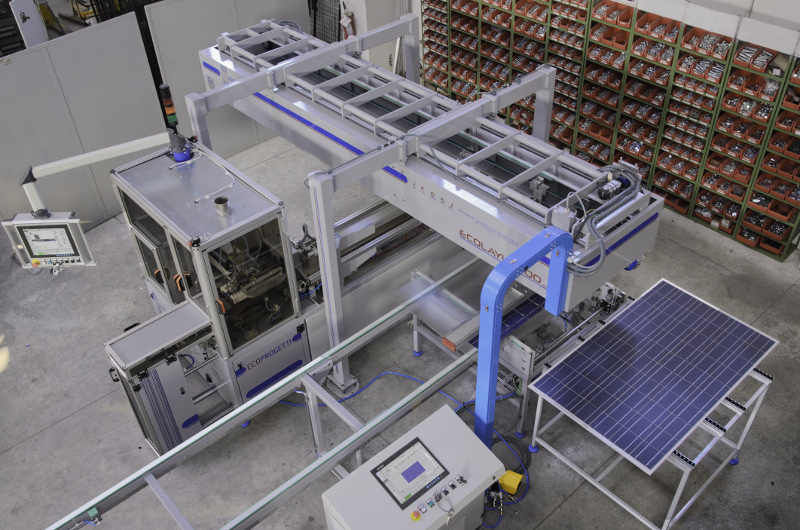 Thereafter, the specially sorted photovoltaic converters arrives at the operation of the assembly using tabers / stringer machines, i.e. the equipment, which is initially soldering to the rear and front contacts of solar cells, pre-tinned copper bars, and then the sequential connection of these photoconverters into chains ( strings) of the required length. Next step is carried out successively- parallel connection previously prepared solar cell chains in a matrix (e. g., the size of 6×10 cells or 6×12 cells) and formed a «sandwich» consisting of glass, pre-cutted film sealing material (EVA), photovoltaic cells, a second layer of sealant and back protection module (Tedlar). In fact, at this stage the internal circuitry of the solar module and its value is determined by the operating voltage and operating current. 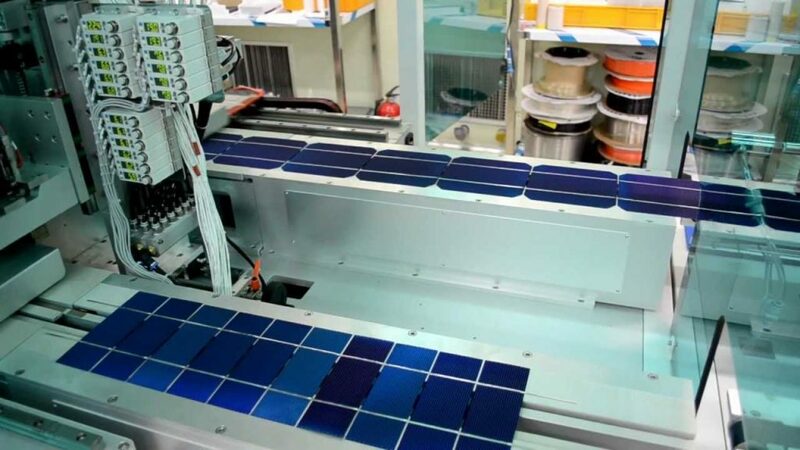 After assembling of all components of the solar module, the received semifinished product is tested for the absence of an electric circuit breakdown and enters sealing at high temperature and exceeding pressure. This operation is called lamination, and the semi-finished product that came out on its case – is called laminate. Testing of the finished solar module includes determination and measurement of electrical parameters of voltage breakdown. As testers a compact device can be used in a way shown in the figure below, and as specially equipped workshop premises in which the ultra-precise set simulators solar radiation with the required characteristics. After testing the finished solar modules are sorted by class products, packaged and fed smoothly or sent to the consumer. Like any technological process, manufacturing of solar panels has quite a lot of exceptions and technological «know-how». It is very important how carefully workers follow the technology requirements in the production, input and intermediate controls are conducted, which photovoltaic cells, and other materials and equipment are used , and how likely the interference of the «human factor». 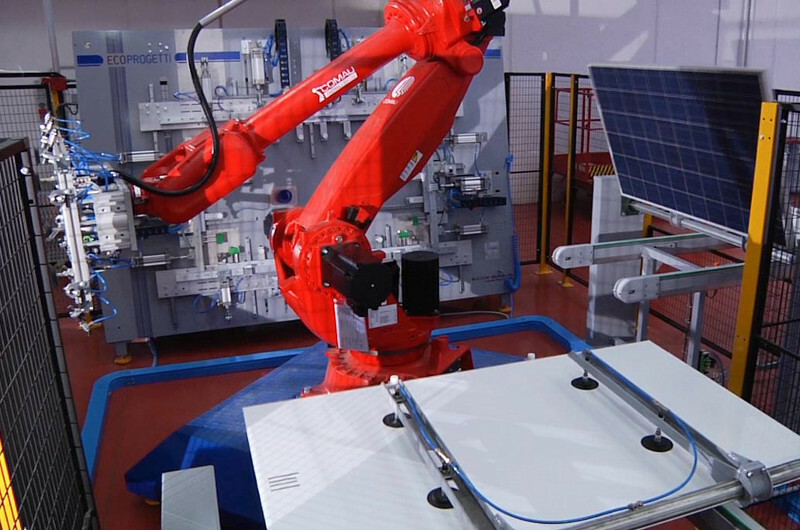 Recently, the trend for consolidation of factories to produce solar cells is noticed. A typical semi-automatic production line has an annual capacity of about 30 MW. And the world’s largest manufacturers moved their assembly lines in Asia and increase performance up to hundreds of megawatts per year. Their products undergo the strictest quality control and certified according to international quality standards. All these facts create very unfavorable conditions for smaller manufacturers, but in general it promotes cheaper solar panels and the cost reduce of “solar” electricity.